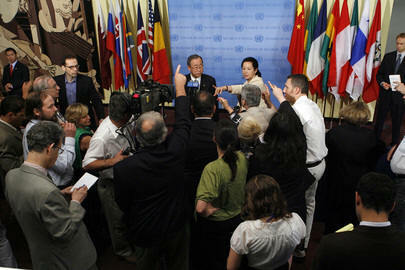 UNITED NATIONS, June 11 -- When and why does the UN speak off the record? This is the tale of six briefings -- four that have happened and two that have not -- and of a practice that is in lurching evolution on the shores of Turtle Bay, at UN Headquarters. On Monday a background briefing was offered by "a senior UN official" about the Special Tribunal for Lebanon created by Security Council Resolution 1757. Speaking without his name, this individual estimated that the Tribunal could cost some $30 million a year, compared he said to $100 million a year for the UN tribunals for Rwanda and the Former Yugoslavia. The individual said, "I've hired for some times, months ago, one former officials of one of these tribunals to help us" set up the budget. On other aspects of the tribunal, the individuals made comments on the record, because "some of your colleagues abroad would like to know more about the tribunals." The individual was asked, why is this on background, why can you not be named? The individual said the goal was to avoid "frustration" for reporters, with so many "open questions." Inner City Press; There�s something called the Sudanese Media Centre, which has reported that Mr. Bashir has again said that this was an attempt by Western countries to re-colonize Sudan. Is this the type of thing that he says to the Secretary-General? Is there any response from the Secretariat? Spokesperson: No the Secretary-General was not aware of that. This is a media report and this is not the tone of the conversations that the Secretary-General has had in the past with Mr. Bashir. "Although the quote is fine and can be attributed to [redacted], our concern is that if you use it together with quotes attributable to 'a senior UN official,' everybody will know that it was [redacted] who did the background briefing. I would ask you to please use the quote in a way that doesn't compromise the identity of the briefer." This proviso was thrown out the window five days later, by a sophisticated senior UN official who mixed on-the-record and not-for-attribution quotes. In near-ludicrous obeisance to the UN's inconsistent and often unexplained demands for secrecy, Inner City Press is not using any of Monday's briefer's on-the-record quotes. It is, however, time for the UN Secretariat to get it together with regard to its briefers who are produced only if they are not named. The need for reform remains on display in the never-amended anonymous accusation of a senior UN official to dozens of UN correspondents, repeatedly stating that a white plane used by the Sudanese government in Darfur, with "UN" on its wing, came from Kazakhstan. Later, Inner City Press' research, still not contested by the UN, matched the number on the plane's wing with a Russian airline, and after deliberation, Inner City Press did not name the UN briefer, but stated his nationality, Russian. It's also worth noting that, at the end pf a previous briefing about the Congo, when a wire service reporter said she would not write about the briefing or the issue unless the briefer's name could be used, this briefer said, "Fine, use my name." Can you say, arbitrary? Inner City Press was later approached by an individual in the UN Department of Public Information -- apparently no one in the UN is supposed to be named -- and had what seemed to be a clarifying conversation. Among other things, Inner City Press advised that particularly in light of the UN's position that as an inter-governmental body they must defer to member states (during the 2007 meeting of the UN Permanent Forum on Indigenous Issues, canceling a human rights film about the Hmong at the request of Vietnam, click here for that), the UN should not be requesting anonymity in order to accuse, as it now appears falsely, a member state. The conversation seemed productive, although the issue was again raised last month when Inner City Press asked that the List of Staff of the UN Secretariat be released. On June 11, Inner City Press was pointedly reminded, "this is a background briefing." Spokesperson: This is not a new investigation. It is not a new allegation. This is something going back to 2005, as you know. There have been a number of investigations around that specific case already. I think the Secretary-General mentioned today that an investigation had been launched by SRSG [Special Representative of the Secretary-General William Lacy] Swing, who last week asked the OIOS [Office of Internal Oversight Services] to conduct a full investigation into all detainees held by MONUC�s [United Nations Organization Mission in the Democratic Republic of the Congo] Ituri Brigade in 2005. So, this is not a new investigation into a specific case, it [is] a continuing investigation. Question: So, then a 'renewed' investigation. Can we have someone come and tell us about the developments and what�s being done to stop future incidents and so on and so forth? Spokesperson: Well, as you know, subsequent information was provided to DPKO by Ms. Arbour last week and that will be provided to OIOS as part of the ongoing investigation. I'll try to find someone who could come and brief you on this once the investigation is completed. The problem is, if the past is any guide, the investigation might not be finished for two years. Finally, for now, the most-needed briefing, which should be on the record but has not even been offered on background, is by the Deputy chief of staff. The nominal chief of staff was witnessed leaving UN headquarters alone at 8 p.m. on Monday. He has appeared, on the record, in the briefing room on February 9. From the Deputy chief of staff, whom the LA Times called the real Secretary-General, why no briefing? Developing.